Since we're already into double digits for this January, it's lucky you don't have to tie a planner or agenda to a particular start date. All you really need is a block of time for going through your stashed yarns and fibers, and thinking of all the things you want to make. I used my two weeks off over Christmas to good purpose on the sorting and the thinking, and came up with a customizable planner I think you might enjoy too - if not now, then perhaps someday if you start to feel overwhelmed rather than cheerful about your crafty progress, as I did. The steps are all written out as I did them rather than as you might want to, for which I hope you will forgive me and not feel that this is an All About Me post... even though technically, it is. H'mmm. At any rate, here's what I did. 1. I tore a piece of my favourite paper out of a notebook so it would be a/ nice to write on and b/ face out and plainly visible - the better to deter procrastination. I wrote down all the things I knew I wanted to make at some point, including the still-unstarted tea cosy of course - and put it at my desk in an easy-access spot for when I thought of more. It took me several days to remember everything, not to mention to find all the works in progress hiding out inside little cloth bags, but I did get there eventually. 3. I assigned a number of hours to each of these project ideas. 4. I looked over the very messy page and panicked. Then I typed it all up. Under 'item', I started with the type of project - 'socks', 'weaving', 'spinning', etc. so I could sort the data by that information later, if I want. In the 'due' column, I assigned the number of the month I wanted to have the project finished - 02 for February, 12 for December, so that I could take advantage of MS Word's table sorting feature. For non-urgent projects like the socks and hats from yarn I just didn't want to give away, I assigned 99 so that when I let Word sort the columns they'd land down at the bottom. Once you have that kind of data in a column, you have a lot more power over your queue and yarn stash than before. In Word, you can sort columns any way you want, so it's easy to prioritize by date or type of project, not to mention that you can easily calculate how many hours you're looking by letting Word add up that column for you. So: next time somebody points out to me that a cool mystery shawl KAL is starting, I can look at my due dates and see whether or not participating in said KAL is going to cripple me come December when I'm supposed to be wrapping gift knits. 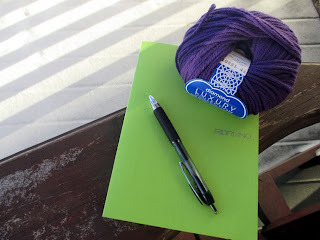 And if I'm bored with what's on the needles right now, I can look at the list to be re-inspired to start something that's been languishing there. I mean: it's not like there's not lots of choice. I still get to play with pretty patterns on Ravelry too, because all I've assigned to certain yarns is 'Cowl' or 'Fingerless Gloves'. I can knit any pattern I want and even change the type of pattern, as long as it will take about the same amount of time I've allocated for the knitting. This part really is all about me. If I add up all the hours of all the projects I'd like to make with the yarn I currently have on hand - not counting any of the Vesper sock yarn because that way lies madness - as of January 4 I had 449 hours of knitting time ahead of me. Of those 449, I want to have 301 of them done by the end of 2014. Assuming about 11 months of knitting time is about 308 days, that's just around an hour a day for the essentials, with the other 148 being carried over to the following year to bump up whatever ideas I still have left at that point. And if I knit an extra 7 hours per week... I'll be able to knit a dozen pairs of Vesper socks this year. See what I mean? All that knitting chaos that was stressing me out: gone. All is manageable. What would you like to do with your knitting time in 2014? You're so right Leslie - simple is best right now! Fortunately there are lots of useful and pretty things that are also simple. Brilliant! I have some projects and ufo's sorted out, but didn't make a list. I will also use this for my weaving projects, not just gathering everything us, but the list, the plan! Thanks Mary! You are so welcome Jerri!